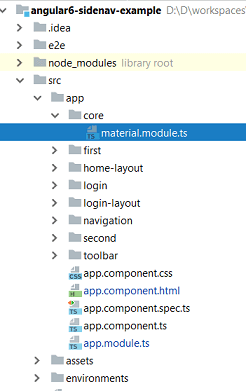 In my last article, we looked into creating a SideNav using Angular 6 material designing in a single page application(SPA). But in most of the real time scenario, we require the SideNav to be hidden during login and viewable only after successful login. Being a SPA with routing implemented, sometimes it becomes challenging to do so. 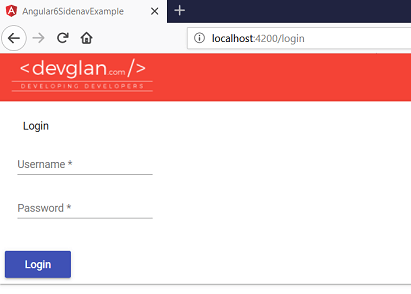 Hence, in this article we will be creating a SPA with routing to hide SideNav during login and make it viewable post login. There are two ways with which we can achieve it. First, the very simple but not standard way is by using ngIf and secondly, we can use multi-layout design with children routes implemented. Here, in this article we will be using second approach. In this example to keep things simple, we will be creating only 2 layouts but you can create as many layouts as you want. We will define two different layout as login-layout and home-layout component and these component will be our parent routes and remaining all the other routes will be child routes. Apart from this, we can also use angular provided AuthGuards to secure these routes and we will be discussing about AuthGuards in next article. We have already created many Angular 6 app in my last articles. You can find the complete article of creating Angular 6 App here. Hence, let us just review the CLI command we used to set up Angular 6 project and integrate material designing with it. For a clear implementation, I have created a separate file - material.module.ts and imported in our app.module.ts. Below is our final project structure. Our main idea to hide SideNav is by creating multiple layouts. In the following routing configuration, we have 2 parent routes configured as login and home. With login we have simply LoginComponent which will be rendered in <router-outlet> and post login main route will be rendered. Inside the main component, we have again 2 child routes. These 2 child routes will be rendered in the main content of SideNav based on the nav item clicked in the side content and the url becomes main/first and main/second. In the app.comonent.html we have removed all the html elements and only <router-outlet> <router-outlet> is present. We can also have routeguard configured here but we will be doing that in our next example. pathMatch = 'prefix' tells the router to match the redirect route when the remaining URL begins with the redirect route's prefix path. login.component.html also has directive <app-toolbar></app-toolbar>. With this we can have multiple toolbar component for login and home. Following is our navigation.component.html. This is the same component we created lat time when we were discussing about SideNav in Angular 6 Material in my previous article. You can visit it for complete explanation of Sidenav. With this much configuration, we can have our home component with SideNav in it. 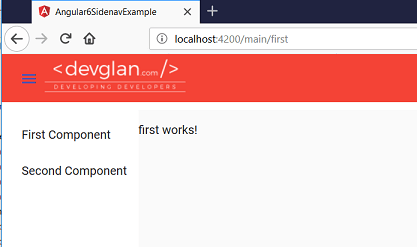 In this article, we discussed about hiding Angular 6 Material SideNav during login and show it only post login in the home screen. We also looked into how we can have multiple toolbar for login and home page in a SPA. You can check out the source from my github page here.